Windows Media Player 11 has been released and available for full download at Windows Media Home for Windows XP users (SP2 is not a necessity). 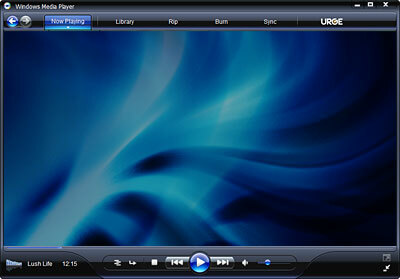 Windows Media Player 11 offers users a glimpse into how Windows Vista will look like when it’s released, as WMP 11 is designed as an integrated part of Windows Vista. WMP 11 also takes music download and integration with portable media or MP3 or WMA player to the next level, as per iTunes 6. There will be new music services (Urge) and new portable players (iRiver Clix and Creative Zen Vision:M etc) to exploit it. New stylish, streamline and simplicity design as close to that as Windows Vista’s WMP11 as you can get. All music is automatically imported, which may take a while based on your collection size. Redesigned engine enables the fast loading and browsing of large media collections. A simplified music library that’s easier to navigate. Built-in search bar for easily finding lost music. URGE music service, digital music service for Windows Media Player 11 with MTV as a partner. Easily synchronizing media collection with portable devices by using wizards. Disc spanning feature that enables you to burn large amount of media to more than 1 CD. WMP11 can be easily uninstalled by using the control panel. As WMP11 is listed as a Windows XP Software Update, so if you are using Windows XP SP2, check the box next to Show Updates at the top of Add/Remove Programs in order to view it. Uninstalling Windows Media Player 11 will revert back to the original version of Windows Media Player, which should be WMP9. If after un-installation the Windows Media Player is version 9 and you wish to return to WMP10, Windows Media Player 11 can be download at Windows Media Home. Windows Media Player 11 has been received favorable reviews since release. In download review of ComputerAct!ve (link dead), WMP11 has been rated 4 out of 5 and given comment “an intriguing preview and worth a look”. CNet reviewed WMP11 and gave WMP 11 the rating of 8 out of possible 10 (Excellent), with comment that for Windows XP users, Windows Media Player 11 is a must-have upgrade. It’s Microsoft’s best jukebox effort to date, thanks to a thoughtful redesign, impressive performance, and a ton of useful features. The good of WMP11 include Windows Media Player 11 has a simple and visually effective interface; excellent performance, especially with large media libraries; and solid integration with Urge, its de facto music service. However, there are the bad which include still in beta, Windows Media Player 11 has some bugs to work out, though we didn’t notice any major ones. Plus, there’s no podcast directory yet. If you’re not convinced enough, there are also 10 reasons to love Windows Media Player 11 from CNet’s MP3 Insider (link dead), such as deft music store integration, improved performance and contents choices. Windows Media Player 11 and Urge slide show from CNet can be found here (link dead). On the review page, you can found a video preview too. PC Magazine also reviewed Windows Media Player 11 with a slide show, gave the rating of 4 out of 5 and chose WMP11 as Editor’s Choice. The comment is that Microsoft still has some work to do before it launches Windows Media Player 11 for real. Metadata lookup could be faster, and the interface, while good, needs tweaking – for example, some of the buttons you use most often are too small. But this media player is a lot more fun to use than any other, and just as powerful. InformationWeek also concluded that Windows Media Player 11’s design changes and interface improvements are not only appealing eye candy, but enhance the navigation and listening experience as well. For those brave enough to install pre-release software, Windows Media Player 11 will prove to be a significant — and welcome — upgrade.